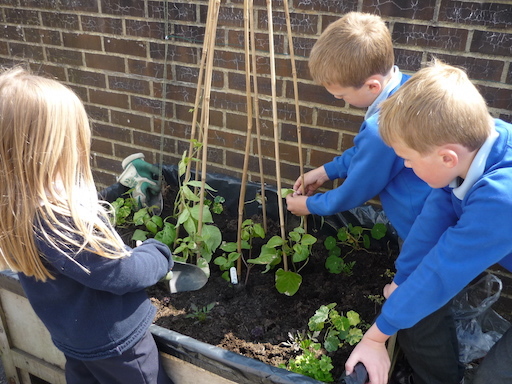 ALFI is keen to involve local schools in its community vegetable-growing activities and to encourage an interest in gardening amongst young people generally. 2010-2011 We gave primary schools seed packets and some grew seedlings to plant in some of our plots and planters. And we had a stall at the Alton College Green Week to encourage interest in growing food locally. 2012 We gave each school some fruit bushes or a fruit tree, as part of our fruit-growing theme. 2013 We gave them each a large container and some seed packets, to encourage container growing. We also helped at an Amery Hill Working Party to fill raised beds in their central quad to grow vegetables. 2014 Our theme was ‘Growing and Using Herbs’ we delivered a selection of herbs to the local schools, as well as holding a herb-based competition. We asked children to plan a herb garden and to send us their design. We were pleased to get 127 entries, and some imaginative and interesting ideas. 2015 Our theme was ‘Useful flowers in the Vegetable Garden’. We asked children to design a poster to illustrate any aspect of this. 2016 We had nearly 300 entries in the schools competition on the theme of ‘Greening Grey Britain’. All prize-winning posters are displayed on ALFI plots around the town. 2017 In the Spring ALFI donated an apple tree to any primary school in town that had room for one – we gave away 7 trees. For the children’s competition we asked children to design a garden based on the ingredients for a recipe, be it a dessert, main course, drink or snack, e.g. strawberry lemonade, pizza, soup. Young children take a natural interest in growing things, and enjoy gardening and ALFI hopes to continue its support of these activities.